A Canterbury fixture for a few more years, Cera will be either the star of recovery or the target of an embittered public…It started with a handful of government department phone-ins and Civil Defence hangers-on, in a shabby office smelling of fresh paint, hammering out a plan to rebuild Christchurch. Now they are everywhere. They hold meetings with grumpy, earthquake-stricken residents and offer bus tours of devastated central Christchurch. They buy thousands of homes, order the demolition of 20-storeyed buildings and politely tell the public where they can and cannot go. It easy to forget that the Canterbury Earthquake Recovery Authority (Cera) has existed for less than a year. 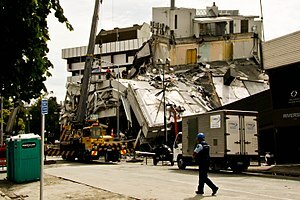 Since the state of emergency was lifted after the February 22 quake, the authority has assumed the central role in Christchurch’s recovery. The Canterbury Earthquake Recovery Act, passed in April, has given Cera and Earthquake Recovery Minister Gerry Brownlee unprecedented power. They can change laws, bypass courts, seize property and take over almost any responsibility normally left to local councils. For those who want more information, here is the direct URL for CERA. The closest analogy to this type of organization that I can think of in the U.S. is the use of an urban renewal authority, with eminent domain powers, to lead the recovery planning process. I would like to hear from folks in the U.S. how this approach would be greeted in their localities. This entry was posted in Earthquake, New Zealand, Redevelopment by recoverydiva. Bookmark the permalink. Great post and many thanks for following this huge event for a small country.